Here's what you need to know about Fortnite's Season 8 week 7 challenges. Fortnite Season 8 week 7 is finally here, bringing an assortment of new challenges for players to complete. If you’re looking to complete all of them and earn the big reward this week, then you’ve got your work cut out for you. We’ve got all the details for the Fortnite Season 8 week 7 challenges below, so let’s dive right in! The challenges this time around shouldn’t be all that hard to pull off, with many of them being tasks that players can complete during normal play. To help make things easier we have outlined all of the challenges below, as well as provided some additional instructions to help you complete them quickly. All the challenges in Fortnite Season 8 week 7. 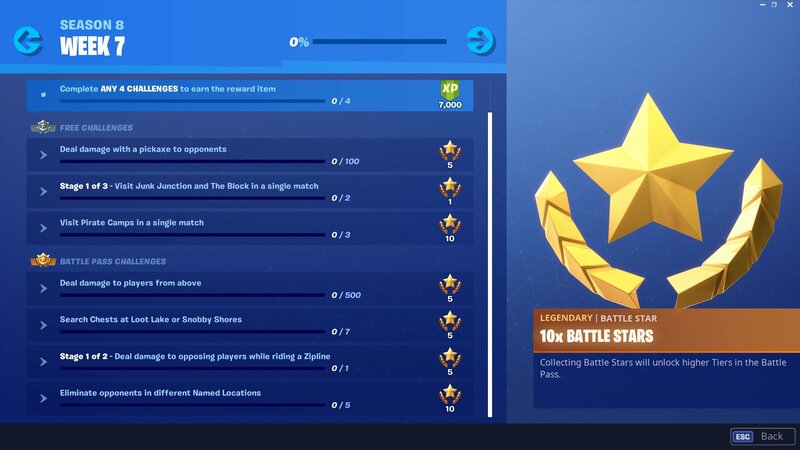 All you need to do to complete this challenge is drop into highly populated areas and deal damage to opponents 100 times using your pickaxe. You’re bound to die a bit trying to complete this challenge, but just focus on dealing damage and rushing opponents and you should pull it off. This is just the first step of three, but all you really need to do here is land Junk Junction and loot the area. When you’re done, immediately beeline for The Block, which is located just southeast of Junk Junction. From there, continue playing through and earn that Victory Royale. Completing this challenge will be a bit more difficult, as the Pirate Camps are located all around the map. With seven total options to choose from, which ones are the easiest to visit in the same match? You can check out our guide to all Pirate Camp locations for all the different options, but the easiest camps to visit in the same match will be around the center of the map, situated around Shifty Shafts and Salty Springs. There are four camps situated in this centralized area, making it pretty easy to move from one to the other. Titled Towers is nearby, though, so make sure you watch your back and don’t let any enemies sneak up on you. The easiest path is to hit the Pirate Camp just west of Dusty Divot first. From here, beeline it south past Salty Springs to the next camp. Finally, head eastward towards the desert biome to hit the final Pirate Camp. All you need to do is build up and deal damage to players above you 500 times. Both of these areas feature plenty of chests for you to loot. You’ll need to loot them seven times total, though, which might take a couple of matches to pull off. There are a lot of ziplines around the Volcano, making it an easy place to complete the first stage of this challenge. You’ll need to kill five opponents in different Named Locations around the map. To do this, just drop into named locations and pull off at least one kill in each area. Easy peasy. 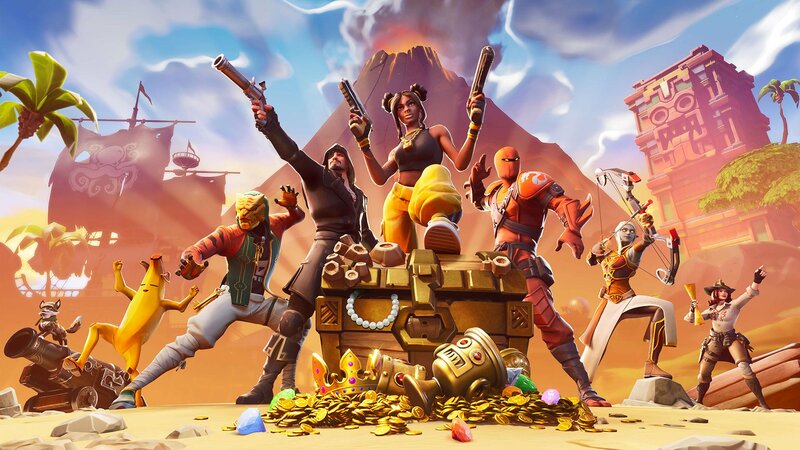 Now that you’ve got everything you need to complete all of Fortnite’s Season 8 week 7 challenges, head on over to our other Fortnite guides for more help in the hit battle royale game.